This is a scalable context timeline. It contains events related to the event June 9, 1996: ’Unabomber’ Charged for Two Bombing Deaths. You can narrow or broaden the context of this timeline by adjusting the zoom level. The lower the scale, the more relevant the items on average will be, while the higher the scale, the less relevant the items, on average, will be. 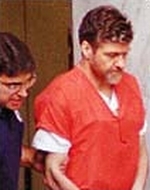 Theodore “Ted” Kaczynski, the so-called “Unabomber” (see April 3, 1996 and June 9, 1996), interrupts the first day of his murder trial by asking to meet privately with the judge to demand replacements for his defense lawyers—and perhaps to defend himself—and to protest his brother David Kaczynski’s presence in the courtroom. [Washington Post, 1998] Kaczynski halts the proceedings before the jury enters the courtroom by telling Judge Garland Burrell Jr. that he has a “very important” statement to make about his relationship with his attorneys. “Your honor, before these proceedings begin, I would like to revisit the issue of my relationship with my attorneys,” Kaczynski says. “It’s very important. I haven’t stood because I’m under orders from the marshals not to stand up.” Kacynzski spends four hours in chamber with Burrell and his lawyers. It is believed that Kaczynski is fighting against his lawyers’ attempt to portray him as mentally ill (see November 9, 1997)—a “sickie,” as he has termed it in his journals. At least two mental health experts hired by the defense have found that Kaczynski suffers from the delusions of a paranoid schizophrenic. Kaczynski has refused to be examined by government psychiatrists, and has cut off interviews with his own doctors when they broached the subject of his possible mental illness. As a result, defense attempts to present evidence that Kaczynski is mentally ill have been hampered, and prosecutors have refused to countenance any attempts at a plea bargain that would spare Kaczynski the death penalty (see December 30, 1997). Kaczynski’s brother has been one of the strongest and most impassioned advocates for Kaczynski’s classification as mentally ill, which would spare Kaczynski from execution. Two victims of Kaczynski’s bombs, Charles Epstein (see June 22, 1993) and David Gelernter (see June 24, 1993), disagree; both say that Kaczynski should die for his crimes. Lead prosecutor Robert J. Cleary (see April 11, 1996) demands in court that Burrell “firmly and finally” resolve the disagreements between Kaczynski and his lawyers. Burrell says he is trying, but notes that difficulties prevent him from quickly resolving the dispute: “A criminal proceeding sometimes involves dynamics that a judge has to react to,” he says. [Washington Post, 1/5/1998] Defense counsel Judy Clarke says Kaczynski “simply cannot endure” being portrayed as mentally ill, and notes that he has harbored an abiding fear throughout his life that people will consider him insane. Such resistance to being considered mentally ill is symptomatic of his paranoid schizophrenia, Clarke says. Outside the courthouse, Clarke says that Kaczynski’s request to represent himself “is a tragedy at its worst,” and denies that Kaczynski is attempting to stall the trial. “This is not manipulation. This is not cunning,” she says. “This is not someone trying to avoid legal responsibility.” Anthony Bisceglie, the lawyer for David Kaczynski, says the Kaczynski family believes that allowing him to act as his own attorney would be “to allow him to participate in a federally assisted suicide.” [Washington Post, 1/8/1998] The judge will reject Kaczynski’s demands (see January 7, 1998). Entity Tags: Theodore J. (“Ted”) Kaczynski, Garland E. Burrell Jr.